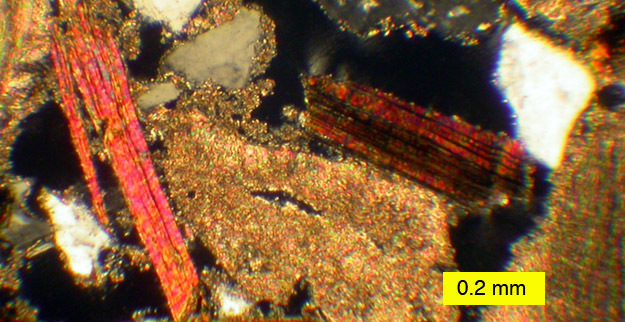 A beautiful view of a modern hardground in thin-section with cross-polarized light. The platy pinkish and brown grains are the minerals muscovite and biotite (micas), the gray and white angular grains are quartz, and the tan irregular grains are recrystallized shells and cements. Sample dredged from about 650 meters in the Strait of Messina between the Italian mainland and Sicily. Collected by Agostina Vertino. WOOSTER, OHIO–Bitterly cold Ohio days are perfect for geological lab work, especially with thin-sections under a warm microscope accompanied by a music-filled iPod. The next best thing to fieldwork. A thin-section is a slice of polished rock glued to a microscope slide and then ground down to a standard thickness of 30 microns so that light easily passes through it. Minerals, fossils and other internal features become visible in a thin-section which would otherwise go unnoticed in the hand sample. We use polarized light to reveal optical properties of the crystals for identification and analysis. Often a thin-section in cross-polarized light shows an astonishing array of colors, fabrics and textures. A hardground (cemented seafloor) sample from the Strait of Messina (the same rock as seen in the thin-section above). 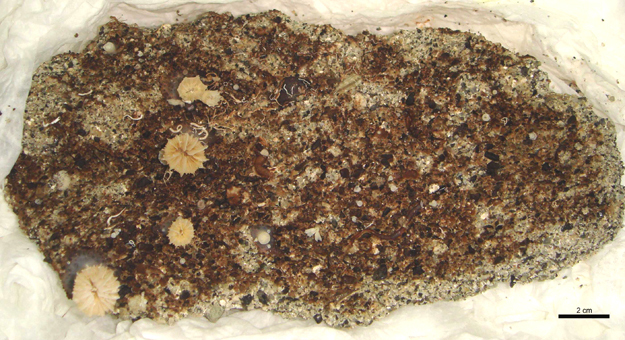 This sample was dredged from the deep-sea and is encrusted by the coral Desmophyllum dianthus and tiny tubeworms. Collected by Agostina Vertino. A sample of the same hardground as above with the organic material removed. On the right is a closer view of the sand-sized grains making up the rock. Notice that even in this view you can tell that the grains are poorly cemented to each other. An Italian colleague (Agostina Vertino of the Dipartimento Scienze Geologiche – Università Catania) and I are examining these unusual hardgrounds from deep in the underwater canyon at the bottom of the Strait of Messina. This is a very energetic system (the currents are fast), so the grain size is surprisingly coarse for a deep-water deposit. The composition of the sediment is highly variable, ranging from feldspars and micas to shell fragments and microscopic skeletons of foraminiferans. Our first question is the simplest: How are these sediments cemented? The thin-sections show us. Carbonate rock fragments in the Strait of Messina hardground showing a thin fringe of calcareous crystals (probably aragonite) precipitated on their edges. The cement is formed when these crystalline fringes intersect and hold the grains together. As you would expect, a rock so lightly cemented crumbles easily, and it has a very high porosity and permeability. 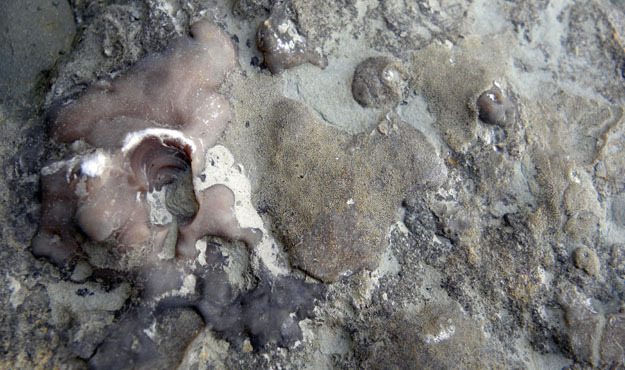 It is remarkable that such an unstable substrate serves so well as an attachment surface for encrusting organisms such as corals, tubeworms, bryozoans and sponges. The black areas in this thin-section view (as in the others) are open spaces. This particular hardground is highly porous and permeable. Note the bright fringing cements on the grains. The porosity and permeability of this sediment is undoubtedly a key to its cementation. Fluids could move quickly and in considerable volume through this deposit, gradually precipitating the tiny, tiny calcareous crystals on the exposed grain surfaces. It is also possible that dissolving aragonite shells in the sediment supplied the necessary carbonate for the cement. There is much work ahead to figure that one out. We will post more portraits of our geological laboratory studies this winter as we simultaneously prepare for next summer’s fieldwork. This is the life! CAESAR CREEK STATE PARK, OHIO–I’ve definitely extended my field season as far as possible. (And what a season it has been.) My last fieldwork at the end of this research leave was in Ohio, about three hours south of Wooster. I visited Caesar Creek State Park this morning where a large cut through an Upper Ordovician section has been set aside as a fossil preserve of sorts. It is an emergency spillway for Caesar Creek Lake, which is maintained by the US Army Corps of Engineers. Many Wooster paleontology field trips have stopped here. 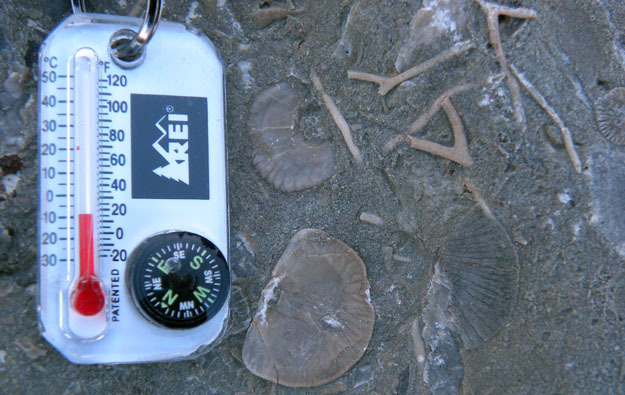 Fossils can be collected, but only with a permit (obtained at the visitor center) and following significant regulations. The fossils are diverse and abundant, including all the stars of the Ordovician seafloor. My task was to find, photograph and measure an old trace fossil friend: the boring Petroxestes pera. This is a slot-shaped excavation in carbonate hard substrates formed by bivalves (probably in this case the modiomorphid Corallidomus). The boring Petroxestes pera (the name means "purse-shaped rock-grinding") in a hardground at Caesar Creek State Park. These elongated holes are among the first bivalve borings. Some of my students and I think they may have been formed in clusters, and they also may be oriented relative to each other and their local environment. In any case, I found plenty. It was an astonishingly cold morning, though, so I didn’t waste any time on the outcrop! Yes, this photo is here mainly to show just how tough Wooster Geologists are. And there are some very nice brachiopods and bryozoans! ... when your car is well frosted. MAYSVILLE, KENTUCKY–Strong earthquakes produce seismic waves which can do much damage on land, as we well know. They can also disturb unconsolidated sediments on shallow oceanic shelves and platforms, producing characteristically swirled structures called seismites. The Upper Ordovician outcrop we visited today has three horizons of well-preserved seismites associated with those strange blocks described previously. The "ball-and-pillow" structures in this view of the Kentucky Route 11 outcrop of the Fairview Formation are seismites produced by Late Ordovician earthquakes. There are two seismite horizons visible here, each with a flattened top produced by later erosion and redistribution of the sediments by oceanic currents. The earthquakes which caused these seismites were probably associated with orogenic (mountain-building) activity to the east where the present (and much later) Appalachian Mountains sit. Careful measurement and mapping of seismites can tell us much about the specific locations and magnitudes of these earthquakes, as well as the consistency of the sediments they disturbed long ago on those ancient seafloors. MAYSVILLE, KENTUCKY–Our short geological expedition to northern Kentucky today was to look at some odd blocks of limestone that sit suspended in the sediments as if they were dropped in while the sequence was accumulating. An eroded, bored and encrusted limestone block in the Fairview Formation (Upper Ordovician) of northern Kentucky at the Route 11 outcrop (N38.61243°, W83.75575°). These rocks are bored by worms and encrusted by bryozoans on their top and sides, and they often sit at high angles to the surrounding strata. Bryozoans encrusting a side of the block above. The beautiful pinkish bryozoan on the left is the holdfast of a ptilodictyoid which in life held an erect bifoliate portion of the colony. The field of view here is about 10 cm wide. It is difficult to imagine a mechanism which deposited large, lithified limestone blocks in the middle of a shallow carbonate ramp. They are almost certainly related to “seismite” structures in the outcrop (see next post), but how these earthquakes would have transported such rocks is a mystery. We also do not know how quickly the limestone had been lithified before emplacement. We do know that the sides of these blocks were exposed on the seafloor long enough to accumulate encrusters and borers. Plenty yet to discover in these well-studied rocks. It is a continuing lesson for scientists: the more you see the more questions you have. MAYSVILLE, KENTUCKY–Today I visited the University of Cincinnati for a meeting of Aaron House’s thesis committee, on which I serve. (Aaron is a 2004 geology graduate from The College of Wooster.) It all went very well and soon after Aaron took me and two other geologists on a short field trip to an Upper Ordovician outcrop near the Ohio River town of Maysville. Outcrop of the upper Fairview Formation (Upper Ordovician) on Kentucky Route 11 near Maysville, Kentucky (N38.61243°, W83.75575°). A distant Aaron House for scale. Many Wooster students and alumni will immediately recognize all the elements of a typical roadside outcrop of the Cincinnatian Group in winter: gray rocks matching the gray sky, the muddy ditch at the base, and the thin verge of grass extending to the road. Alternating limestones, siltstones and shales give the outcrop its jagged appearance. 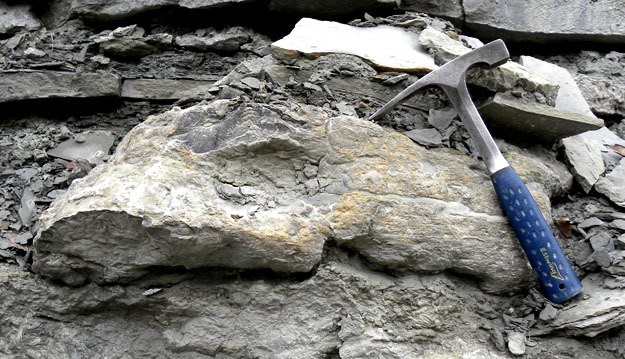 Some of the best Ordovician fossils in the world are found in these sedimentary sequences, and the stratigraphy holds many mysteries despite over a century and a half of intensive study by geologists. Wooster students have completed dozens of Independent Study theses with these rocks, and there are many more to come. Aaron House is now pursuing a masters degree by assessing and interpreting the preservation of mollusk fossils in the Cincinnatian. The Mineralogy of Hotspots by Elizabeth Deering (’11). The Mineralogy of Acid Mine Drainage, presented by Lindsey Bowman (’12).